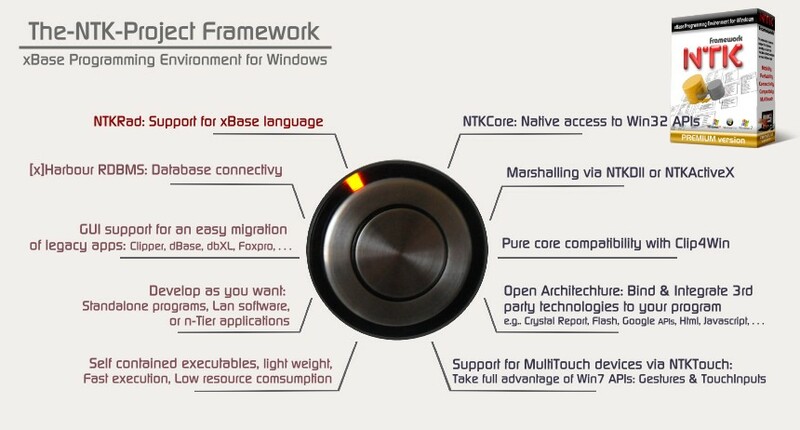 The NTK-Project is a professional framework that allows developers to create Windows applications by using a simple & efficient programming language that combines an xBase syntax with native Win32 API functions. 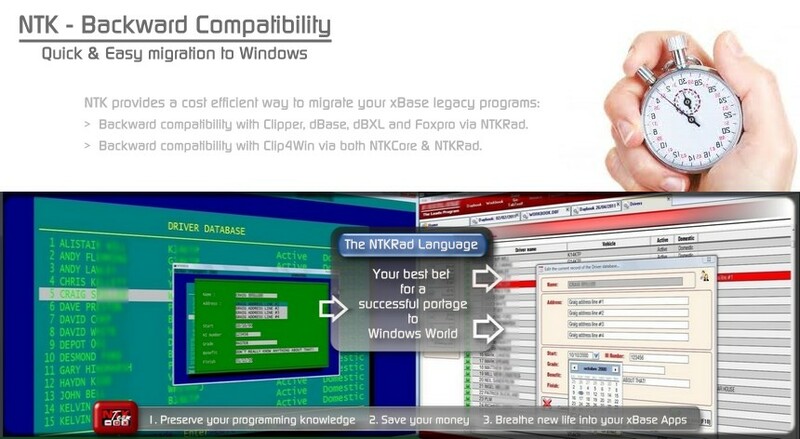 NTK-framework renews with the smart and legendary simplicity of the xBase programming paradigm. Plus, it allows the developer to mix both NTKCore & NTKRad development styles. Meanings: capability to insert native orders to Win32 APIs from and within the xbase syntax of a PRG. Develop whatever you need: standalone programs, local network software, or powerful n-tier apps. Remember, NTK relies on the xHarbour RDBMS and takes full advantage of its strong & robust database engine. i.e.  Reach n-Tier databases like MySql, Oracle or MS-SqlServer through the 'NtkAdoRdd' library. 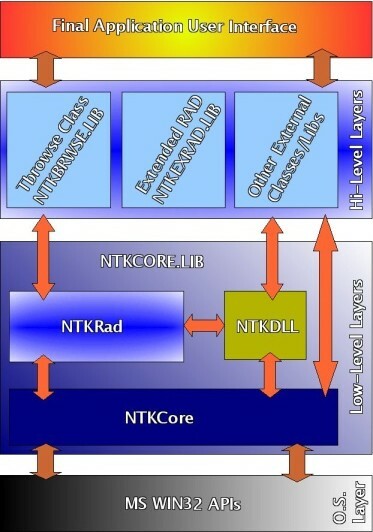 Embedding external technologies into your NTK application is now very easy by using the NTKDll layer (Marshalling) or via the NTKActiveX OO class. 1. Save your time & money: You only have to focus on your business logic. 2. Preserve your knowledges: Keep on using your favorite programming language. 3. Ensure a smooth transistion: Start migrating now, but gradually improve your Application UI, whilst you're making progress in the NTK/Windows learning curve. 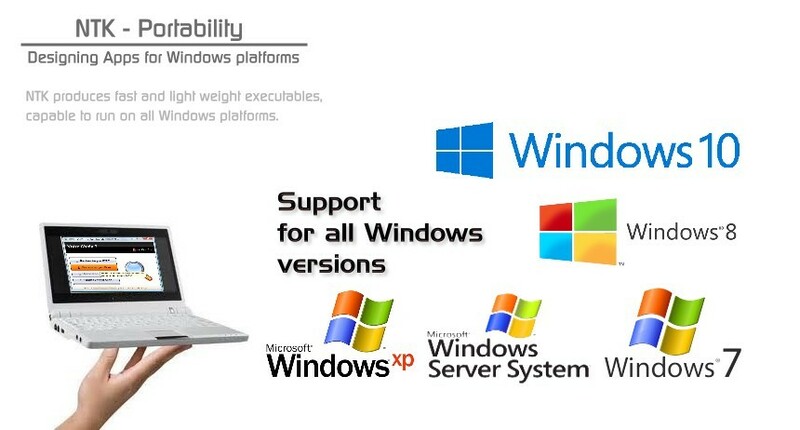 NTK produces GUI applications running on all Windows platforms from Win98 to Win10 32/64 bit. 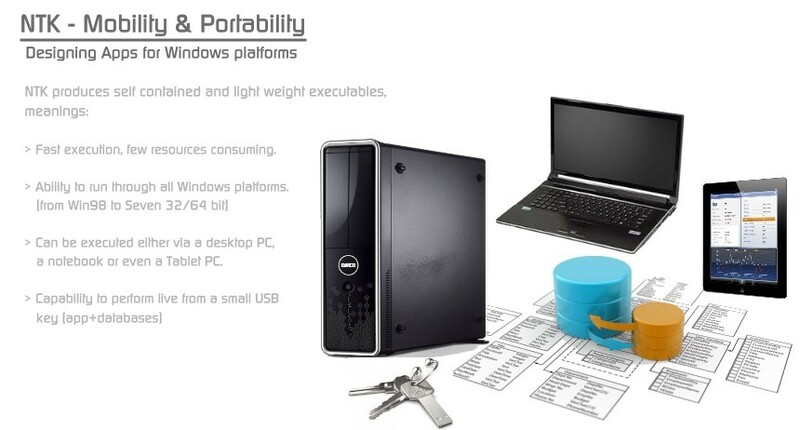 Also, same program can be run either on a desktop, notebook or even a tablet PC. 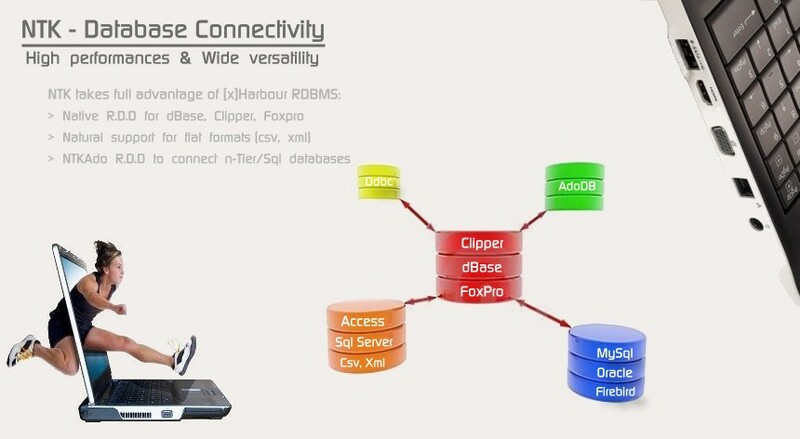 ...To the point that any standalone program or network oriented app that uses the DBFCDX or DBFNTX RDD as default storage format, can be run (including databases) straight from a small USB key! Awesome, isn't it? 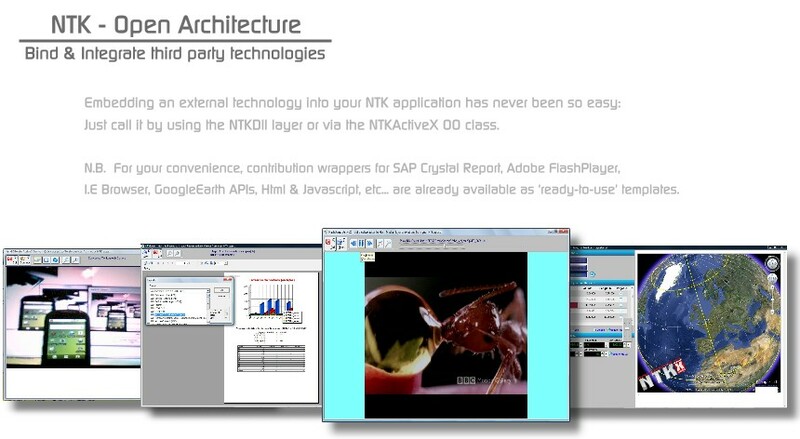 The NTKTouch library has been especially designed in order to provide a complete support for manipulating Gestures and MultiTouchInputs APIs available in Windows 7, 8 & 10. Now, NTK developers are able to create innovative applications that take full advantage of new tablet PCs or any other kind of multitouch devices. Pan, Zoom & Pinch, Rotation and Tap, are now familiar concepts to the NTK developer.